United States consul at Bern, Switzerland; born July 1, 1851, at Lübeck, Germany. 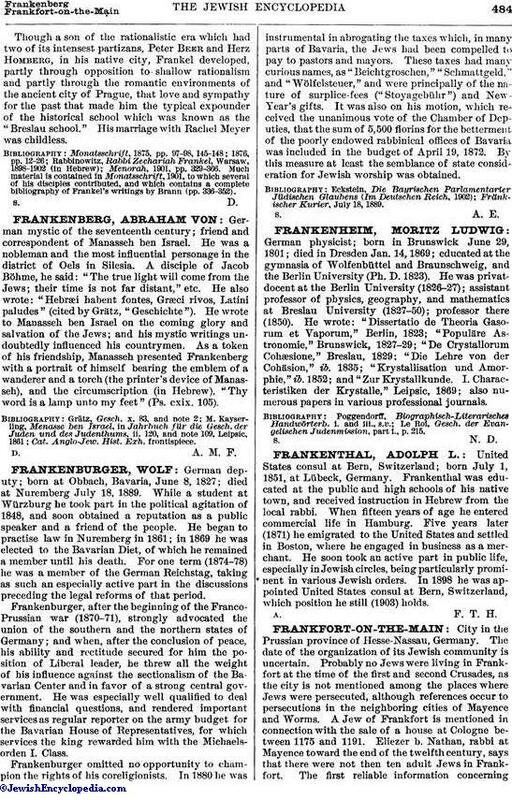 Frankenthal was educated at the public and high schools of his native town, and received instruction in Hebrew from the local rabbi. When fifteen years of age he entered commercial life in Hamburg. Five years later (1871) he emigrated to the United States and settled in Boston, where he engaged in business as a merchant. He soon took an active part in public life, especially in Jewish circles, being particularly prominent in various Jewish orders. In 1898 he was appointed United States consul at Bern, Switzerland, which position he still (1903) holds.